In September 1918 the Spanish Aeronautica Militar announced a competition, which also had a contest for bomber airplanes. Surprisingly as Spain was neutral and the Great war was nearing its end. 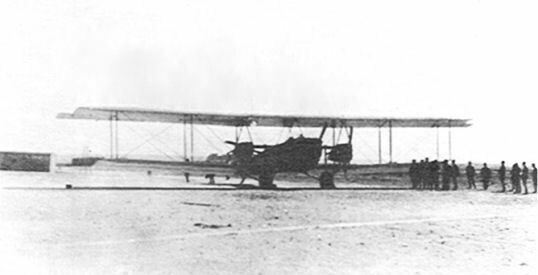 This 3-engined bomber was entered in the competition, but was slow in completion (May 1919 actually). The machine was an encellent flyer, but in one of the tests on 8 June 1919 the pilot Julio Rios Angueso flew too slow and the machine stalled. The plane was completely wrecked, but the pilot received no serious injury. The machine was developed by the firm sociedad industrial de construcciones aeronauticas llamada B.C.D. (Barcala-Cierva-Diaz) in Madrid. It was the third type developed after two biplanes (BCD1 and BCD3) and one monoplane (BCD2). This third machine was called ' El Cangrejo' (The Crab). The machine was powered by 3 red painted Hispano Suiza engines of 220 hp each. The machine reached with a weight fully loaded a cruise speed of 160 km / hour. C is Juan de la Cierva who between 1913 to 1919 completed an engineer study in roads -, channel and harbor construction. (No specific aeronautics study).